There’s an attic in Black Rock where some of the region’s most interesting musicians, comedians, and artists congregate to shoot a Wayne’s World-style TV show. The TV show is appropriately called The Attic in Buffalo, and it’s hosted by Pat Williams and produced by a group of his friends, some of whom share the rest of the apartment with him, and some of whom contribute from across the state in New York City. If you didn’t know otherwise, one might assume the attic backdrop is a studio and that the whole show is professionally produced, but in fact the whole thing is produced by a crew of DIY artists on their own dime. “The idea came out of the middle of nowhere,” says Williams sitting in the control room of the attic. It’s funny to say, but yes, the Attic has a control room, complete with a recording studio and video screens to monitor the shoot. The show’s crew varies slightly from episode to episode. It’s based mostly on who has the free time, energy, inspiration, and dedication to work on the project. The crew includes 28-year-old Williams, who acts as producer, director, and host of the show. His younger brother, Chris Williams, also works on the show as associate producer, camera operator, and occasional resident DJ under the alias Roboroc. Keith Barker, the show’s lead editor, is from Clarence but lives in New York City, working as a producer and editor at CBS Interactive. Director of photography Micheline Veluvolu also works as a photographer for the Buffalo Sabres and the Rochester Americans. Other positions include art director Brandon Bryant, assistant director Justin Walker, production assistant Steve Buonanno, Al Polanski (also known as DJ Pizza Pizza, who wrote the show’s theme music), and art director and motion graphics designer Michael Miosi, who moonlights as DJ Miosi and lives in one of the apartments connected to the attic. “I used to stay on the couch, but I’ve upgraded to a room,” says 24-year-old Miosi, who sits on a ledge in the control room swirling a glass of whiskey, straight up. He tells me that he learned some of his video editing and Adobe After Effects skills making frag videos of his kills in the video game Counter Strike. He’s a graduate of SUNY Buffalo State with a degree in communications, and aside from working on the show, he has a day job and makes money making lyric videos for people over the internet. Chris Williams also lives in the apartment now. He went to UB and Fredonia, where he earned a bachelor’s degree in accounting. “My brother got me into doing a DJ gig over at Noir and that took off. We did that for two years. My main focus has been on music and music production,” says the younger Williams, who has helped construct the space with his brother. They built the stage in the back of the attic, lit by an impressive lighting system and surrounded by production equipment. The two of them also refurbished the control room and studio in the attic. “Nobody is getting paid, everybody is volunteering their time and money and equipment. That’s why we’ve only done five episodes in 12 months, but I hope to find a way to make this self-sustainable,” says Williams. They also can’t shoot in the summer because it’s an attic and it can get pretty hot up there. The short-term goal of the show, says Williams, is to create enjoyable content. They’ve done that by booking some great bands, including PA Line, who appeared on Episode 5, which was released on November 5. The episode also features DJ Roboroc, comedian James Kurdziel, poets Brandon Williamson and Team (Irvin) Finks, artist Mark Adamusik, and a comedy sketch featuring Linda Nolan and Hot Garbage Comedy. The sketch is an SNL-style faux commercial for a made-up service called Band Mom—a spoof on Angie’s List. Oddly enough, the actress who plays Band Mom is Linda Nolan, mother of Taking Back Sunday guitarist John Nolan, who Williams met during a shoot in New York City, where he worked for three and a half years. The cast of Episode 6 of The Attic in Buffalo. While working in New York, Williams made a living doing lighting gigs and working as a production assist on shows like 30 Rock. “The first day Tina Fey said hi to me but I couldn’t say hi back—the starstruck feeling goes away quickly, though. If you treat them like humans they’ll treat you like a human,” says Williams ,who studied audio and radio at SUNY Fredonia. After three years working overtime, Williams longed for some free time and space to express some of his passions in life, including playing the drums, which was nearly impossible in New York. He moved back in June 2014 and was immediately inspired to launch his own DIY web TV show. “Buffalo is a major producer of creative people and it’s a city with a lot to offer,” Williams says in the introduction to the first episode of the series, released in October 2014. Since then the team has created four more episodes, all released over the past year. Guests have included a slew of local artists, comedians, poets, and DJs. They recorded their latest episode just last Sunday during a three- or four-hour shoot. 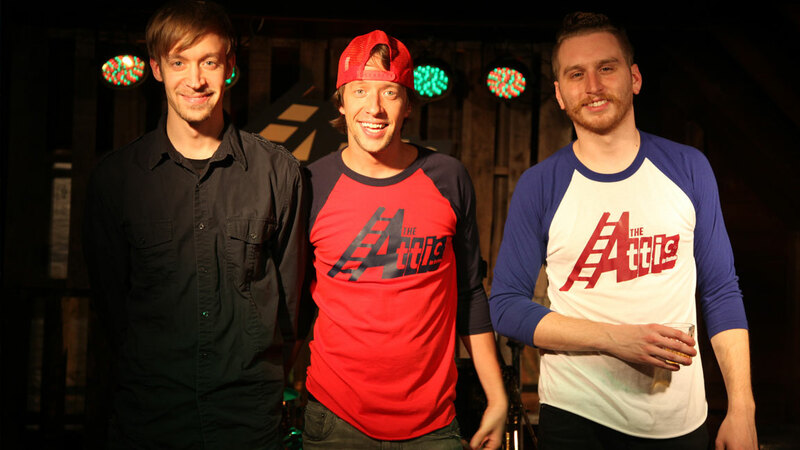 Most episodes take place primarily in the attic, with the exception of some of the skits, but for this episode they partnered with 103.3 the Edge to record a special musical segment with local band the Trews in the Edge studio. The production of each episode begins with Williams writing an outline for a script with intro and outros and slots for music and skits. Once the outline is created, they start booking the acts. Finally, they invite their friends and friends of friends to sit in as a studio audience for the live recording. They usually host 10 to 15 guests per shoot. “We keep it low-key. We have to protect the property so we don’t really advertise where we do this,” says Miosi. “Also, we all own guns,” he adds, laughing. Exploring the attic a little more, it seems like a fun place to watch a taping. The guys see the space as an intimate and exclusive venue for their audience. “The energy in here is insane. We had this guy Micha on for a show, and this room was just perfect for him, and everyone was just slack-jawed after his performance,” says Williams. The future of the show becomes clearer as they proceed. Right now, they’re content with the show existing as its own entity, driving traffic to their YouTube channel, but they’d like to seek a local media partnership. Perhaps a weekend TV slot on a local TV station. Williams would also like to find a host to replace him so that he can focus on directing and producing the show.